Applications: For use on the FiniMaster II machines and other 125mm machines with M14 spindle fixing. Use for surface cleaning, light coating removal, restoration, scratch removal, blending and final brushed finishing stainless steel. The ceramic grade 60 wheel will give longer life and better performance in most situations, especially on harder alloys. It will also remove light mill scale. Product Notes: M14 screwed fixing goes directly on to Finimaster II, FiniPower and other machines. These wheels have the benefit of 5in diameter giving much more controlled finishing (less risk of jumping) and much longer lives than the 4in equivalents. 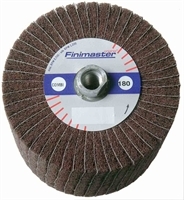 Also Available: For FiniMaster I and PTX type machines, we have equivalent 4in diameter wheel brushes with 19mm keyway, type FMCA.